Our NextGenUDT™ featuring ToxProtect™ DNA-verified Urine Drug Test (UDT) helps prevent opioid addiction, uncover diversion, and ensure patients are compliant when taking medication. Unlike other toxicology labs, our UDT uses DNA to definitively authenticate samples, reveal mislabeling errors, and detect urine sample substitutions. 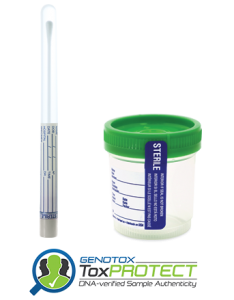 Using a urine sample and a quick, one-time cheek swab obtained during the patient’s first visit, the genomic cross-verification process behind ToxProtect quickly and conclusively matches every subsequent urine sample to its donor, detects over 100 controlled substances, and identifies synthetic or substitute human urine. Know for sure with ToxProtect. Our pharmacogenetics department offers a comprehensive selection of tests designed to help physicians create a safe and effective medication program. Helping physicians understand how a patient’s genetic makeup is likely to influence their response to a drug allows them to better treat their patient, both in terms of therapeutic and adverse effects. Utilizing two advanced toxicological modalities—ToxProtect DNA-verified urine drug test and pharmacogenetic testing—we specialize in providing accurate and dependable toxicology lab results, helping physicians deliver patient-centric medication and sobriety monitoring. Genotox Laboratories is a CLIA certified, high-complexity toxicology and pharmacogenetic laboratory based in Austin, Texas. We’re not your average tox lab. With DNA-verified urine drug testing for sobriety and medication monitoring, you can count on us for all the answers you need. For assistance, information, or to have a representative contact you, please send us a message.